I ordered 3 for my new home and they are well built and beautiful! I love the color of the wood as well as the shade top. This user was entered into a sweepstakes after submitting their honest review. Add comfort and style to your kitchen with the Hillsdale Velvet Counter Stool. 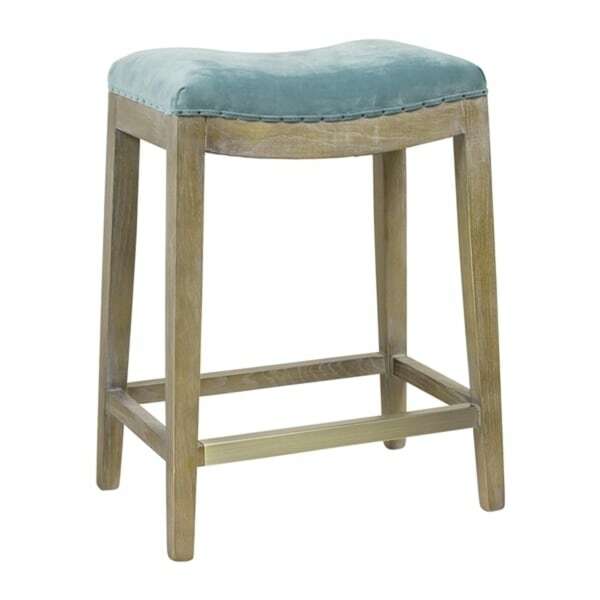 This stool features a stylish french contemporary design with a wooden frame and a contoured blue velvet seat for comfort. great quality, love that it slides easily out of the way under the counter but is still sturdy and super cushioned. Wood finish blends beautifully with lots of different wood finishes and my white kitchen. Loved the color of the wood, and that it has a metal foot guard. I purchased these knowing I planned to reupholster them in a different fabric, so I have some recourse..but I would have been dissatisfied with them as is. The padding on the seat is so soft that I totally sink when I sit down and I'm a small female. I will be having my upholstery guy add more dense foam to firm up the seats, so beware for heavier users. I ordered 3 for my new home and they are well built and beautiful! I love the color of the wood as well as the shade top. The weight limit is approximately 350 pounds. "is this fabric more aqua or blue?"